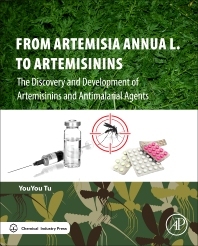 From Artemisia annua L. to Artemisinins: The Discovery and Development of Artemisinins and Antimalarial Agents is the first book that systematically introduces the origin and development of artemisinine and artemisinine-based drugs. It includes four distinct sections, including Artemisia annua L., Artemisinin, Dihydroartemisinin, and other artemisinin derivatives. Tu Youyou, the chief inventor of artemisinin, together with other members from the research team, have written a book that will be a valuable reference work for both researchers involved in the medical industry and scholars who are interested in undertaking innovative research. Presents a full view of artemisinin, not only its origin and development, but also chemical structure, chemical properties, extracting mode, derivatives, chromogenic reaction, general pharmacological, and toxicology. Part I: Artemisia Annua L.
3. Anti-malarial studies of artemisia annua L.
5. Analysis and quality control of artemisia annua L.
4. Extraction of artemisinin from artemisia annua L.